NRPA members across the country, along with local PBS member stations, will be hosting events with PBS KIDS Explore the Outdoors activities and materials. From nature treasure hunts to investigations of weather, wind and the local environment, families will be invited to participate in hands-on experiences that encourage kids to learn about science and nature. For more information on local events, or to pick up materials to explore the outdoors on your own, visit PBS Parents (PBSParents.org/outdoors). 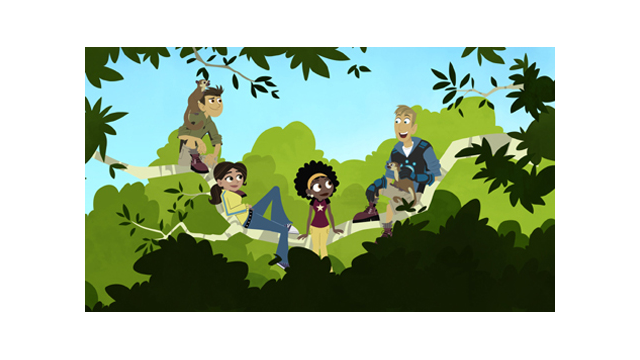 WILD KRATTS “Backyard Adventures Week” - March 26-30 This special week features five episodes all about venturing outside to explore the wonders that are as close as your own backyard. The week concludes with the premiere of a new episode, “Flight of the Pollinators,” on Friday, March 30, which explores the amazing delivery system of plants and their animal partners. DINOSAUR TRAIN “Nature Trackers Week” - April 2-6 This encore presentation of four “Nature Trackers” episodes of DINOSAUR TRAIN includes “Stargazing on the Night Train/Get Into Nature!,” “Shiny and Snakes/Tiny Flowers,” “Buddy Explores the Tyrannosaurs/Rainy Day Fight” and “That’s Not a Dinosaur/Tiny’s Garden.” The storylines follow Buddy, Shiny, Tiny and Don as they make their own discoveries in nature. The episodes encourage kids to get outside, get into nature and make their own discoveries. THE CAT IN THE HAT KNOWS A LOT ABOUT THAT! “Nature’s Know-How Week” - April 9-13 The Cat, Nick and Sally go on a variety of outdoor adventures this week, including journeys to Drippety Dry Desert and Splishy Splashy Pond. Two new episodes premiere: “Super Cleaner Uppers/Itty Bitty Water” on Monday, April 9, and “Amazing Eyes/Water Walkers” on Thursday, April 12. CURIOUS GEORGE “Explore Your World Week” - April 16-20 During this special week, everyone’s favorite monkey dabbles in a range of activities – from radio DJ-ing, to painting, to building a home for a squirrel. The week includes three premiere episodes – “DJ George/Curious George Paints the Desert” on Monday, April 16, “No Knowing Gnocchi/Here Comes the Tide” on Wednesday, April 18, and a special Earth Day episode, “Junky Monkey/Jumpy Warms Up,” on Friday, April 20. Select episodic images and screeners are available on PBS PressRoom. PBS KIDS is increasingly serving children wherever they live, learn, and play – online, on mobile devices, on TV, and in the classroom. Kids can continue their environmental exploration online at PBSKIDS.org/outdoors to find environmental and outdoor themed games, activities and videos and on mobile through the PBS KIDS Video App for iPad, iPhone and iPod touch. PBS Parents will provide resources for parents to explore the outdoors with their own families on PBSParents.org/outdoors. The site will provide activities from the on-air episodes, listings for PBS KIDS Day in the Park events, and ideas and resources that families can use to explore the outdoors any time. Curious George and related characters, created by Margret and H.A. Rey are copyrighted and trademarked by Houghton Mifflin Harcourt and used under license. Licensed by Universal Studios Licensing LLP. Television series: ©2012. Universal Studios. All Rights Reserved. About National Recreation and Park Association The National Recreation and Park Association is a national not-for-profit organization dedicated to advancing park, recreation and conservation efforts that enhance quality of life for all people. Through its network of 20,000 recreation and park professionals and citizens, NRPA encourages the promotion of healthy lifestyles, recreation initiatives, and conservation of natural and cultural resources. For more information, visit www.NRPA.org. For digital access to NRPA’s flagship publication, Parks & Recreation, visit www.parksandrecreation.org.